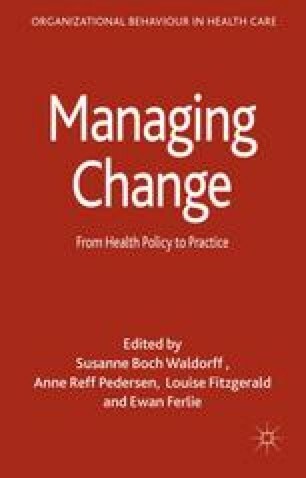 This book is about managing change in healthcare settings. The book draws upon the presentations and discussions at the 9th International Organisational Behaviour in Healthcare Conference (OBHC), which took place in Copenhagen in April 2014, hosted by Copenhagen Business School. The conference theme was ‘When health policy meets every day practices’. The conference was international, receiving papers from scholars in countries worldwide, including Denmark, Sweden, Norway, the United Kingdom, Ireland, Germany, the Netherlands, Belgium, Italy, the United States, Canada and Australia. To date, Palgrave Macmillan has published eight editions in a series linked to the OBHC conferences organized by the Society for Studies in Organising Healthcare (SHOC).